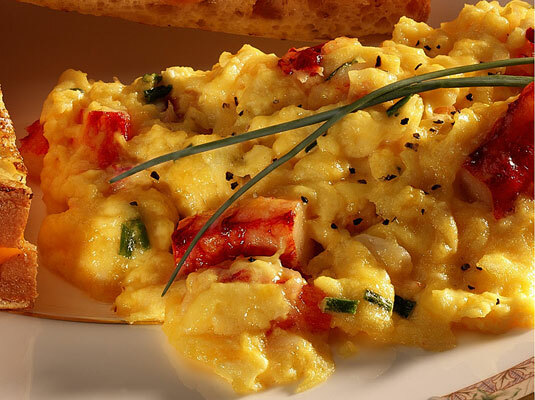 This elegant crab scramble can make scrambled eggs into a meal masterpiece. To make your crab scramble a downright beautiful low-carb egg breakfast, decorate the plate with some colorful fresh fruit and a sprig of mint or parsley. Finely chop the fresh chives. Heat the butter in a nonstick frying pan over medium-high heat. When hot, turn the heat to low. Add the crabmeat and 1 teaspoon chives. Cook for 2 minutes over low heat. In a medium bowl, beat the eggs and season them to taste. Stir the cheese into the beaten eggs. Pour over the crabmeat in the frying pan. Cook for 3 minutes while stirring constantly. Per serving: Calories 313 (From fat 190); Fat 21g (Saturated 10g); Cholesterol 506mg; Sodium 549mg; Carbohydrate 2g (Dietary fiber 0g); Protein 28g.